In any kind of story, whether it be a novel, a television show or a comic book, you want to see growth from key characters. While not everyone featured in a story needs to go on a dramatic journey, where, to quote Stewie from Family Guy, “friends become enemies, enemies become friends,” you also don’t want to keep returning to the same person page after page, or issue after issue and see them remain stuck acting the same way, doing the same things, and playing the same role they’ve always played. That’s why this moment between Peter and Mary Jane from Amazing Spider-Man #122 remains one of my favorites. In my post about Spider Island and ASM #672, I wasn’t shy about my love for MJ, and how I hope that one day, even if they’re not romantically involved, that she and Peter are major, major parts of each other’s lives again. She’s just too well-drawn of a character, with such a great backstory, and a wonderful history with Peter to be buried so much in the background as she’s been since the poorly conceived One More Day/Brand New Day “annulment” of their marriage. 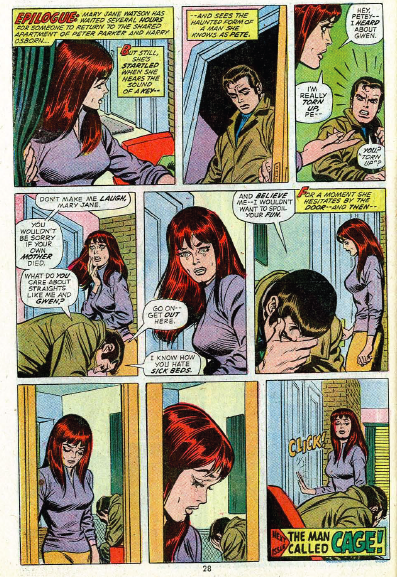 And long-time readers of ASM can probably point to panel above as the moment in history where the MJ/Peter relationship really took an interesting turn. To that point, MJ was the consummate party-girl, who fought for Peter’s affections, but ultimately lost to the more serious, girl-next-door Gwen Stacy. And while Gwen was a great match for Peter in her own right, reader’s probably had a hunch that there was always much bigger plans for MJ, just based on how often she was teased in the series’ early issues and how dynamic her introduction to the world was back in ASM #42. Of course the Peter and Gwen relationship came to a tragically abrupt end when she was thrown off a bridge and killed by the Green Goblin (or was it Peter’s webbing that snapped her neck? Damn it, why won’t anyone ever CONFIRM this?). And that’s the genesis of this very somber, bittersweet moment, where MJ graduates from part-time romantic accessory to a shoulder to cry on and an actual friend to Peter. Up until this moment, you never really got the impression that Peter was friends with any of the women he dated – even Gwen. Sure, there was talk about love, more from a school-yard puppy-dog perspective, but as anyone in a successful relationship can tell you, it’s always best when you’re best friends with the person you pledged to spend the rest of your time with. Now we’re obviously a number of issues removed before Peter and MJ actually become truly romantically linked – his girlfriend just DIED 20 pages earlier! But the groundwork is laid here for Peter and MJ to ultimately engage in some kind of mature relationship. We never truly know what is said between Peter and MJ in this scene – I’m going to speculate that it was a whole lot of silence. But judging by how the two interacted going forward, it was clear that MJ stayed and comforted Peter through all of it. If that’s not an example of a major evolution in a character, I don’t know what is. MJ went from “face it tiger, you hit the jackpot” bravado, to stoic, matriarchal comforter. It’s the strongest I’ve ever seen a woman, not named Aunt May, act around Peter. And that’s what made their inevitable courtship, break-up, reunion and marriage all the more rewarding – the fact that readers saw on this one page, the power and strength and character like MJ brought to the series. The letters column from the issue with Gwen’s death confirmed that it was Spidey’s web that killed her. But then I remember reading Marvel backing off that claim, despite the letter. This reminiscing about MJ and your comments about her role in the Spider-Island finale have brought me to a realization about this character – I think the ultimate effect of OMD/BND on her character was not what was intended by Marvel. That is, I don’t think it minimized her character (though the annulment of the Spider marriage) but, if anything, made her a deeper, higher-impact type of character than she ever could have been had she been maintined as Peter’s wife. I mean, let’s face it, what have most readers looked forward to ever since OMD/BND occured? I would suggest that it is seeing MJ again, in some way, shape or form in Peter’s life. Since she finally returned as a regular character in the Red Headed Stranger arc, we’ve seen her more often, and her appearances, in my opinion, have been all the more powerful for it. It’s something that never could have occured if she was still Peter’s wife. Somehow the fact that the marriage was so heinously annulled and MJ was life-raped (to coin a term) by the Mephisto deal has made her a much stronger, higher impact character than being the Spider-Wife ever could have. Just think of how much impact that “I love you” had at the end of the Spider Island arc, and think of whether or not that could have occured, at that level of emotional impact, if the marriage still existed. MJ has literally been through hell and back as a character, and I don’t think you’re liable to find a stronger, more sypmathetic supporting character in all of comics – and even though some folks may howl at the notion, I think that OMD/BND had a lot to do with that. She is no longer that familial and domestic Spider-wife, she is now the Un-Wife, and somehow is all the more potent of a character for it. Of course, I don’t intend this to be a comment in defense of OMD/BND – that storyline is beyond redemption. And much of the “deepending” of MJ’s character that I allude to above is due more to skillful craftsmanship by the likes of Dan Slott and some of the other “Spidey Brainstrust” writers who did, IMHO, a great job of bringing the book back after the OMD/BND debacle, than anything that was intended by OMD/BND. I just think it’s kind of funny, and ultimately a kind of poetic justice, that the stated intent of OMD/BND is so at odds with the realty of what we see now – a deepening of the Peter/MJ relationship as opposed to deleting it.